Last week’s economic reports included readings on job openings, retail sales and consumer sentiment in addition to weekly reports on new jobless claims and Freddie Mac’s survey of mortgage rates. According to the Labor Department, job openings held steady with a reading of 5.50 million openings in November, which matched October’s reading. Hires and quits showed more activity, which analysts deemed a healthy sign for the economy. Workers typically hold on to their current jobs in times of economic uncertainty, while they may be more comfortable with changing jobs in a strong economy. Increased “churn” in terms of quits and hires suggests that workers are gaining confidence in economic conditions and are more willing to change jobs. There were 1.3 unemployed workers for each job opening, which was lower than October’s reading of 1.4 unemployed workers for each job opening. Retail sales grew by 0.60 percent in December, although analysts had expected o.80 percent growth. November’s reading showed 0.20 percent growth. Retail sales not including the automotive sector grew by 0.20 percent. Analysts had expected a reading of 0.50 percent based on November’s reading of 0.30 percent growth. Year-end promotions and incentives offered by auto dealers likely contributed to December’s increase in retail sales. Freddie Mac reported lower mortgage rates last week; the average rate for a 30-year fixed rate mortgage fell by eight basis points to 4.12 percent. 15-year fixed mortgage rates averaged seven basis points lower at 3.37 percent. Rates for 5/1 adjustable rate mortgages were 10 basis points lower at an average of 3.23 percent. Discount points averaged 0.50 percent for all three mortgage types. New jobless claims were lower than expected last week with a reading of 247,000 new jobless claims. 258,000 new claims were expected based on the prior week’s reading of 237,000 new claims filed. New jobless claims were lower than 300,000 new claims for the 97th consecutive week. The rise in new claims last week was attributed to delays in filing for benefits between Christmas and New Year holidays. Consumer sentiment dipped in January to an index reading of 98.1 as compared to December’s reading of 98.2 and the expected reading of 98.8. 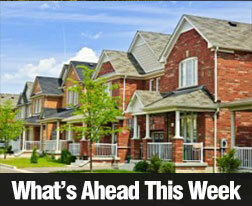 This week’s scheduled economic releases include the National Association of Home Builders Housing Market Index. Commerce Department readings on housing starts and building permits will be released. Consumer Price Index readings are scheduled along with weekly reports on mortgage rates and new jobless claims.